Niacin for lowering cholesterol: Fact or folklore? Does niacin for lowering cholesterol really works? If yes, is there any evidence for this fact or it’s just a widespread folklore? Though niacin is very effective and rapid treatment to lower high cholesterol, it has not caught much attention like other drugs for lowering cholesterol. Many researches have proved that niacin (not niacin-amide) has remarkable effects on boosting the levels of HDL “Good” cholesterol in your blood, better than other prescribed drugs like statins. HDL or high density lipoprotein helps to clean your blood from LDL or low density lipoprotein, the bad cholesterol. Although Niacin is less effective in lowering the levels of LDL “Bad” cholesterol and triglycerides, it might be used as a secondary drug with statins; thus your LDL cholesterol can be reduced significantly. High blood levels of triglycerides and LDL cholesterol will increase your risk for developing heart diseases. When you use niacin, your chances to boost the levels of your HDL or good cholesterol are up to fifteen to thirty five percent. That’s why scientists consider niacin ( B vitamin) as the most effective medication available for increasing HDL cholesterol. It is very important to have high blood levels of HDL cholesterol, because HDL cholesterol can sweep up excess amounts of LDL cholesterol from your blood stream and transport it back to your liver to get rid of it. Therefore, there is an inverse relationship between the levels of HDL cholesterol and LDL cholesterol in your blood; the more your HDL cholesterol, the less will be your LDL cholesterol. In men, the levels of HDL cholesterol less than 40mg/dl, raises the risks for developing cardiovascular diseases, while in women, HDL levels less than 50mg/dl will increase this risk. 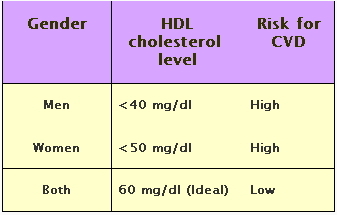 The ideal levels of HDL “Good” cholesterol for both men and women are 60mg/dl. 1. Niacin reduces the fat metabolism, including reduction of the production of triglycerides in the liver through disruption of the transformation from sugars to triglycerides. Actually, this effect is the most notable of Niacin intake. The levels of triglycerides could be reduced up to 50% of its initial values. 2. Niacin also stops the production of LDL, which is said to be the “bad” cholesterol (by 10 to 20%), and VLDL. 3. The decreased level of triglycerides leads to increased levels of HDL, which is the “good” cholesterol. Niacin reall has great effects in incrasing HDL, where improvement of 10 to 35% are expected in the course of three months. The HDL removes the waste products, left by the LDL and decreases the risk for cardiac complications. The decreased LDL and triglycerides levels and the increased HDL levels improve the lipid profile of the person. This is very important for his/her long-term health status. The results are much more impressive if you have really high levels of cholesterol. Even if you have normal LDL cholesterol levels, but the levels of your HDL “Good” cholesterol levels are low, you are still at higher risks for developing heart diseases. Nowadays, there are a lot of niacin drugs in the market which are labeled in various forms, either grouped in multivitamins or as supplements. Niacin is usually sold in higher doses which are prescribed by your doctor when is used to lower high cholesterol levels. Week 1 - you can take 100mg of niacin 3 times daily. Week 2 - you can take 200mg of niacin 3 times daily. Weeks 4-7 - you can take 500mg of niacin 3 times daily. Weeks 8-11 - you can increase the dosage up to 750 mg niacin 3 times daily. Higher doses of niacin (more than 1000 mg per day) can cause some side effects. You might suffer from flushing of your skin temporarily; actually, your skin will be red and so warm. Fortunately, this red flushing will not harm you. In fact, your doctor will recommend you to take an aspirin half an hour before taking your dose of niacin; aspirin can effectively counteract your flushes. Always try to avoid drinking alcohol or hot drinks. Other side effects of high doses of niacin include; stomach upset, headache, itching, dizziness, and liver function impairment. Niacin is contra-indicated for diabetic patients because it raises blood glucose. Your doctor can definitely adjust your proper dose of niacin to decrease such side effects. Furthermore, these side effects are markedly decreased if you take your dose of niacin while eating your meals. Don’t ever take niacin without consulting your doctor first. Get the scientific evidence on Natural Remedies for High Cholesterol.